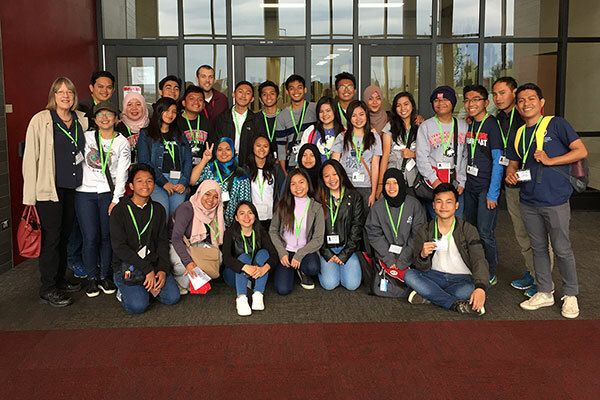 Huntley High School hosted an international delegation of students and educators through the Philippine Youth Leadership Program (PYLP) on Wednesday, April 26. The PYLP is a leadership development program for Filipino students aged 15-17 and adults from Mindanao that includes workshops and learning activities in the Philippines, and a four-week campus-based study and exposure tour in the United States. The tour included a daylong visit to learn about Huntley’s leading education system. Participants toured the building and were paired with HHS students to shadow in and out of class. The day culminated in a joint activity with the HHS Service in Action in Class. Administered by the U.S. Department of State, Northern Illinois University and the Filipino Institute for the Promotion of Integrity & Nobility (FILIPINO, Inc.), PYLP participants are trained on responsible citizenship, civic leadership and community development, and project management. “The students loved yesterday – everything about it. They really liked attending the classes and meeting the other students,” said Sue Russell, Professor Emeritus at NIU who helps coordinate the program. Russell said the participants enjoyed the trip so much that they would like to extend future visits to two days, and that the State Department has already put in a request to continue the program next year. “Huntley students do not always have the opportunity to work with students or groups from overseas. It offers Huntley students an opportunity to see their own experience through the eyes of others. By actively participating in sharing their experience with the PYLP batch it also allows them to reexamine what they most value about being in high school and what they cherish about Huntley High School,” Henricksen said.